SAN DIEGO — The long-awaited overhaul of the North Embarcadero strip is a step closer to reality as the first phase of a Visionary Plan designed to revitalize the corridor begins this month. To mark the milestone, the Port of San Diego hosted an event that featured remarks from San Diego Mayor Bob Filner and other city dignitaries, May 20. San Diego City Council president Todd Gloria, Port of San Diego Board of Port Commissioners vice chairman Bob Nelson and Civic San Diego president Jeff Graham also attended the event. The first phase of the North Embarcadero Visionary Plan began with the relocation of traffic lanes between Navy and B Street Piers. Traffic lanes were moved approximately 60 feet to the east, to allow for construction at the waterfront promenade. With an expected end date in 2014, the project at the North Embarcadero area between Navy Pier and B Street will feature a 105-foot-wide public promenade, public gardens, shade pavilions and other amenities, according to the Port of San Diego. Additionally, two pavilions that will house a café, a visitor information center, two ticket kiosks and public restrooms will be constructed in Phase 1 of the project. Underground cables, pumps, railroad ties and other debris removed during construction of the project were on display the event — along with renderings of the overall project and the artisan glass that will be used in the pavilion buildings. 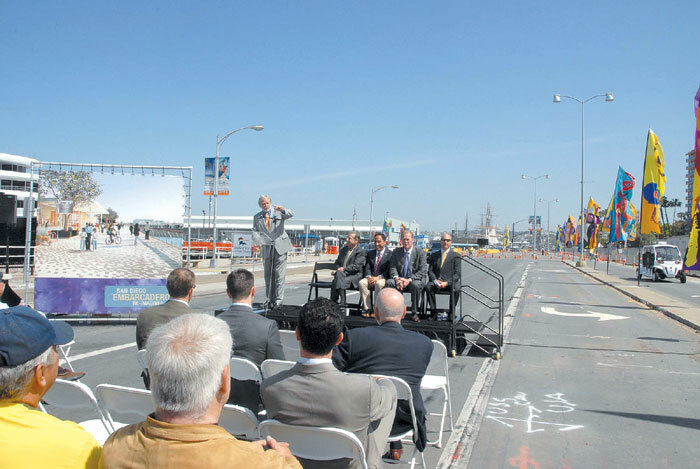 The North Embarcadero Visionary Plan Phase 1 project began construction on January 5, 2012. The project is collaboration between the port, the city of San Diego and Civic San Diego.